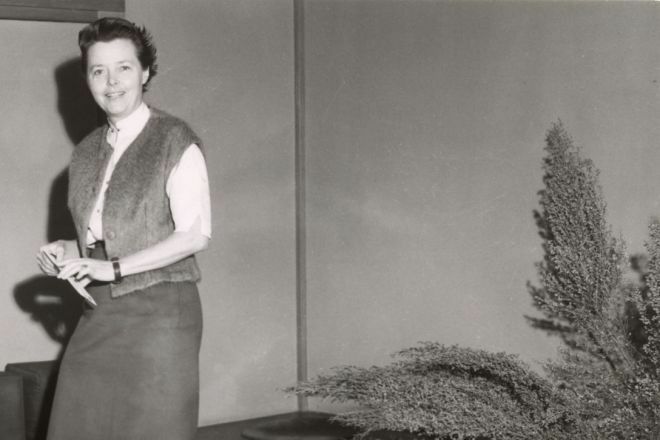 Charlotte Perriand (1903-1999), a tireless traveler, would have surely appreciated this American trip. The New York gallery Venus Over Manhattan pays tribute to the queen of design, the only woman among the twentieth century greats - Le Corbusier, Pierre Jeanneret, Jean Prouvé, Fernand Léger, Lucio Costa, Ernö Goldfinger and Kenzo Tange - with whom she collaborated. The Charlotte Perriand exhibition, created in collaboration with the Parisian gallery Laffanour / Galerie Downtown, on view until January 12th, represents the character of a great designer with 50 pieces. In 1927, Le Corbusier asked her to join his Rue de Sèvres studio in Paris as head of interior design, along with his cousin, Pierre Jeanneret. This was the launching pad that allowed Perriand to work on important commissions, including the apartments of the Unité d'Habitation in Marseille (1945-1952), for whom he designed the Cuisine-bar Marseille (1952), one of the most surprising pieces in exhibition. Perriand chose to place the kitchen module at the center of the living space, a common idea today but rather unusual at that time. Another rare piece is the Table à six pans (1949) based on the design of the first wooden table by Perriand, made in 1938 for his apartment in Montparnasse. The designer interpreted materials and furnishings in an innovative way thanks to her constantly stimulated and curious eye. She found inspiration for her new forms during long walks in the countryside, which she documented in hundreds of photographs. Examples include her curvilinear furniture, like the Chaise "Ombre" of 1954, a product of her stays in Japan, now re-editioned by Cassina. The different stays in the East led to the reinterpretation of many of the iconic designs from her years with Le Corbusier, as well as the introduction of oriental woods and bamboo detailing into her projects, as in the Maison Borot (1959) in Montmartre, a renovation project that took 15 years. Among the pieces on show, covering about 80 years of career, a room has been set up that recreates the lodgings for the students of the Maison du Brésil (also designed in collaboration with Le Corbusier, in '59), with a bed, a desk and a wardrobe. It's been 20 years since Perriand's death, but interest in her work has not waned. This is evident from the success of exhibitions and auctions dedicated to her work, such as the one held last year at Artcurial, where a Bureau "En Forme" sold for more than 700,000 euros.